For people who have always lived in cities, septic systems are a mystery. So a move to the country or even a new development on the outskirts of the city can result in a big and sometimes unpleasant surprise. Suddenly waste from bathrooms and kitchens aren't always swept away � there is talk of drain fields and holding tanks and worst of all, pumping! Before you panic, here is a basic guide to septic tanks and how they work. Unlike sewers which transfer the waste to a central location for purification, a septic system collects, treats and disperses the waste all within your property. The system is made up of three main parts. -A septic tank or holding tank is a watertight holding tank for waste, usually buried a distance from the house or business. -Septic tanks range in size from about 500 gallons to over 1500 gallons. Some septic systems are designed to have multiple tanks, so that each can be pumped more quickly, and waste is better distributed. -Liquid waste exits near the top of the tank and flows through distribution pipes in the drainfield. -Solid wastes need to be manually pumped from the holding tank on a regular basis. For most household septic systems, this means every other year. -Running from the tanks, there is an array of multiple, gravel-lined trenches, usually 2-3 feet deep, where liquid that exits the tank flows. -The trenches are dug on a slope so that liquid waste can flow through the pipes using only gravity. -The trenches must be a foot or more above the ground water level to prevent contamination of the water supply. -Perforated distribution pipes are placed in drainfield trenches, to carry the liquid waste into the drainfield. -The pipes and trenches are covered with soil, which can be planted with grass or flowers. Trees and large bushes cannot be placed over the pipes, as their roots would interfere with the flow of liquids. -Solids settle to the bottom of the tank and form a layer of sludge. 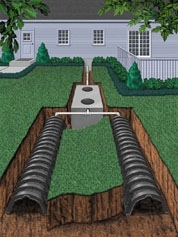 -Waste water flows out of the pipes through the perforations and into the soil of the drainfield. -Natural components in soil neutralize the bacteria and chemicals in the wastewater before they reach groundwater or nearby rivers and lakes. -The ideal soil is aerobic, meaning it contains a significant amount of oxygen, and is not saturated with water. Soggy soil cannot process or break down the waste. Although there are variations on the basic septic system, including sand mounds and cess pools, the basic concept remains the same. Waste is gathered and either pumped out, or distributed via pipes to another part of the property where nature will break down the waste and render it harmless. If you need more information about septic tanks and how they work, consult a septic specialist. You can find them listed in your phone book. Or you can consult with your general contractor to locate a professional to answer your questions.